Africa Eco Race is not only a race. It is the opportunity to help the populations of the countries crossed by different actions done by the Organization or the Competitors. On January 11th 2015, the organization of the Africa Eco Race wanted to pay tribute to the 10th anniversary of Fabrizio’s disappearance. School supplies and toys were collected and transported by the organizers for various missions of which the schools of the MEONI foundation. Julia SCHRENK who is a biker and Africa Eco Race’s rally queen on the 2014 edition, offered tenths of packages full of supplies ; notebooks, color pencils, books, toys etc. which she delivered in person at the schools. Without forgetting the magnificent tribute paid to Fabrizio by the children of his foundation, 10 years exactly after he tragically disappeared. It took place at the Lac Rose during the award ceremony on the podium. In 2016, Pal Anders ULLEVALSETER, the two times winner of the event in Bike has given out all of his ten prize money bonuses to the Fabrizio MEONI foundation in Dakar. Julia SCHRENK, who came especially for the occasion, visited the foundation and offered, once again, school supplies. Stimulate all levels of the national and international sporting world, ever more committing its self in favor of the poor counties. Follow the work started by Fabrizio MEONI for the African children, to favor first of all the scholarship, the training and the right to have a job and a good health. To promote a worthy living to all poor people and to those suffering of injustice and discriminations. To confirm the moral principal and loyalty in the competition. Educate the younger generations to a culture of helping others and respect. To promote the recognition of the work of the catholic missionary fathers and those who devoted their lives to help the people in need. Pal Anders ULLEVALSETER and Julia SCHRENK renew the operation. AFRICA ECO RACE and AMADE Mondiale, a Monegasque association founded in 1963 with the help of Princess Grace for the protection of children, are joining forces on the 10th edition of the Rally to provide portable solar lamps for children which do not have access to electricity. A project which perfectly fits with the eco-responsible and solidarity approach of the AFRICA ECO RACE and the commitment of AMADE Mondiale for the protection and the development of the children who need help on the African continent. Firstly, because these solar lamps are manufactured in Burkina-Faso by the company LAGAZEL, thus developing the local economy through 100 jobs created especially for this activity. Secondly, because these solar lamps will allow children, especially girls, to reach their homes at night in a more secure way and to study under better conditions. Finally, because these solar lamps will replace widespread petroleum lamps in sub-Saharan Africa, which, besides being a source of domestic accidents and being particularly expensive, are an important source of greenhouse gases contributing significantly climate change, each oil lamp produces an average of 200 kg of CO2 per year. 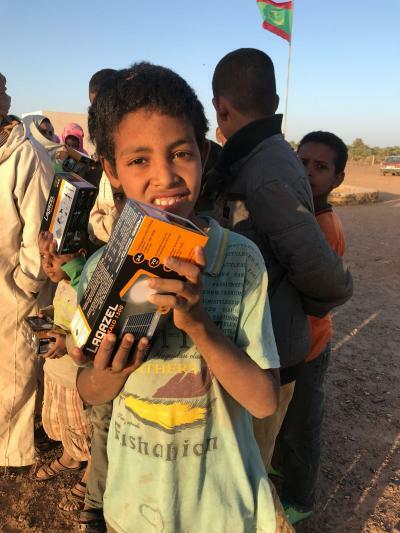 The ambitious objective is to deliver in Mauritania and Senegal, via the trucks of the AFRICA ECO RACE, as many solar lamps as possible distributed to the schools crossed by the rally in Mauritania and Senegal. To do this, teams, participants, partners, members of the organization and all individuals who follow the AFRICA ECO RACE can purchase one or more solar lamps, price per unit of 20€, via a donation directly on the website of AMADE. In terms of communication, AMADE Mondiale and AFRICA ECO RACE will produce a video report illustrating the campaigns for distributing lamps and, if possible, follow-up of beneficiary children on the way between the school and their village. In 2015 and 2016, the organizers of the Africa Eco Race invited children to be part of the award ceremony at the Lac Rose. The kids, with their eyes filled in stars, took the opportunity to spend some time at the finish and share a magical moment full of joy with these great sportsmen at the Lac Rose in Dakar. It was the opportunity to offer them school supplies and clothes collected by members of the organization team. At the end of the day, each one of the kids left with a bag full of gifts. A way of reminding the true values of the Africa Eco Race : Sharing, friendliness and conviviality. Since 1994, the test village, the French and Senegalese NGO (Non Governmental Organisation) based in Senegal, ensures to help children in the streets get out of the negative spirals (drugs, crime, missed schooling, loss of family values…). It concentrates its resources on three main guidelines: the Prevention, the Protection and the Reinsertion of children in danger. To put in place an identification system, a way to approach them in order to put in place a trust with these lost children in order to take them off the streets or out of prison. To favor their reintegration into the school, social and professional systems by using a complete and evolving program. Building up sustainable relationships around the child, with his family, professionals and associations. Insuring to our donators and partners that we are completely honest and rigourous concerning the management and allocation of funds. Placing the children from the streets in the center of our actions, by developing their dignity, their independence and by giving them the opportunity to be actors of their lives. 3 accomodation centers for children (Le Refuge from 3 to 12, l’Oasis from 13 to 15 and le Tremplin from 16 to 25). 1 formation center to various jobs in construction and biological agriculture. «Nadia LOTH decided to launch this NGO to welcome 62 children, creating for them a little world, in order to help them grow up in a nice and healthy environment. Each year, drugs and clothes donations are directly given in Nouakchott. 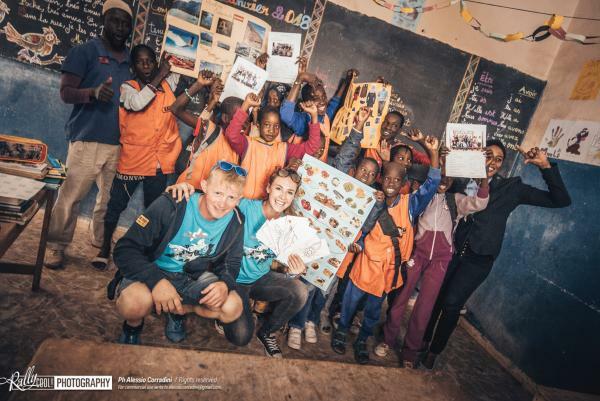 In the 2014 edition, one of the organization trucks, with the help of the Rally Queen, Julia SCHRENK along with Martin FONTYN boss of Team EAO, delivered a complete solar system unit provided by Team Elite Racing at La Khaïma des Petits in Nouakchott. 1 cubic meter of toys and baby equipment were donated by the Team “Les Motards du Désert” and submitted to the municipality of Atar, in Mauritania. Jean Noël JULIEN, Car category participant, raised money to buy several cars that he offered to the Sisters of the Catholic institution of Dakar. MD RALLYE SPORT Team, through their participation in theAfrica Eco Race and the association "Ecurie du Coeur"of the driving team members, allowed fundraising to enable cardiac surgery "Mécénat Chirurgie Cardiaque", in order to operate a dozen African children with heart defects.